Wash cauliflower florets and soak it in hot water. Add turmeric powder as well and soak for 15 minutes. Wash the florets and shallow fry it for 10 minutes. Take a bowl and prepare the paste for frying. Add cornflour and maida (ratio 1:0.5) and mix well. Now add chillipowder,garam masala,cumin powder and ginger garlic paste. Mix well and add soya sauce and egg, beat it well. Add salt and pepper and mix the batter with lemonjuice. Drop all florets in mixed batter and rest it for 15 minutes. Deep fry the florets and chilli gobi is ready to serve. 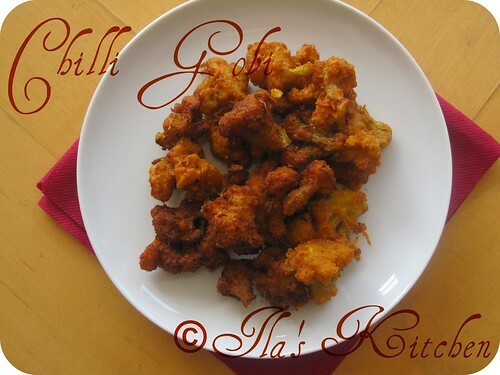 This yummy Chilli Gobi can be served as starter with raitha and lemon . Very tempting dish!!! 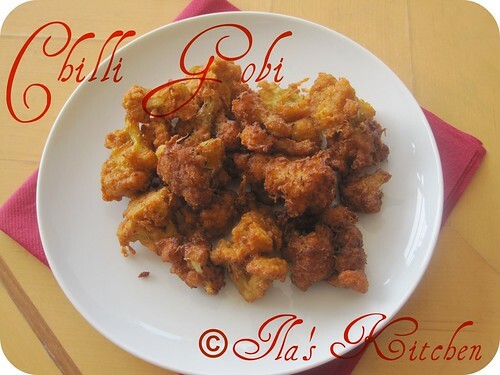 Most of us enjoy having Chilli gobi....nice of you to post the recipe!! Wow these look so yum! Drool-worthy click! Chilly gobi looks very delicious dear! very tempting super and delicious chilly gobi !! Wow tempting and delicious,drool worthy..
chilli gobi looks delicious.. wonderful recipe.. i have always tasted this in every restaurant..
i love anything made with Gobi...chilli gobi looks delicious!! wonderful side dish! Delicious chili gobi. love to try them. Chilli gobhi looks mouth watering.. yummm..
That's a mouthwatering chilli gobi..First time to your blog...yummy collection of recipes...Glad to follow you..
Nice presentation, looks really yummy! That's one of my favorite veg dish! That looks delicious....spicy and tongue-tingling! Looks super crispy and delicious. Love the wonderful recipe , Look so yummy ... I'm sure it must have tasted great too .. SO delicious looking, ila - Love it! Looks crispy and nice Ila :) Good job. wow...chili gobi...one of my favorites ! I'm just drooling over these pics !